Welcome to article #3 in my jazz guitar basics series! I mentioned earlier in this series that chords and tunes are the first thing a beginner jazz guitarist should focus on. In articles 1 and 2 I have focused on chords commonly used in jazz and the theory behind them. Now let’s focus on putting those chords to use and learn some tunes! What Is An Altered Chord? Your Challenge – Start Listening! I would always encourage anyone aspiring to be any kind of improviser to start with learning the blues. The blues can be “jazzed up” by adding and changing certain chords in various ways. This is evident in tunes like “C Jam Blues” all the way to extreme examples such as Charlie Parker’s “Blues For Alice.” This chord progression is often referred to as the “Bird changes,” since that was Parker’s nickname. I wouldn’t recommend a jazz guitar beginner start with learning the Bird changes since it’s somewhat complex. I definitely don’t want to deter you from getting started learning jazz, by learning “jazz/blues,” but eventually, you’ll have to dive head first into jazz, because it is a language and a genre of it’s own. So, assuming you’re ready to make that dive, let’s get started by learning about JAZZ specific concepts, and the basics of jazz tunes. A jazz tune usually consists of 32 measures played repeatedly throughout the tune. Tunes are labeled with a “form” that defines how the 32 measures are broken down, using 8 measures at a time. The form is given a group of 4 letters, with each representing 8 measures. An example is AABC, meaning the first 2 groups of 8 are the same but the last 2 are different. AABA or ABCA are other examples. The “head” is the melody that defines the song, and is played during the first and last chorus of a tune. Each chorus in between the beginning and ending head portions, are used for improvisers to play their solos. Jazz tunes (with the exceptions of the Bossa style tunes) use a very distinct type of rhythm called SWING. You may already know what I’m talking about, and this may need no explanation, but I’ll assume you don’t. Swing is different from a STRAIGHT rhythm. The swing rhythm uses an emphasis on beats 2 and 4 of a measure. In other words, beats 2 and 4 are played a little louder on the drums, bass, or whatever instruments are used to keep time. It also features a “swung 8th note.” This is different than a “straight 8” rhythm, that is commonly used in rock. When straight 8s are played, each quarter note is divided by 2, thus forming the 8th note (basic division). However, a swung 8th note is a note that is played when the quarter notes are divided by 3. This creates a “triplet feel,” but the 2nd note of the triplet is not played, thus leaving the 3rd note to be played. Confused yet? It’s hard to explain without sound. Here is an excellent video of a drummer explaining the difference. Don’t worry if you don’t understand all the technical aspects of swing. It’s better to feel it in your body, than it is to understand it from a technical perspective anyway. Once you listen to enough jazz, you’ll know what it means! It’s not too fast, not too slow, but just the right tempo for beginners to work on. It is often played in G Minor, or E Minor. On guitar, I tend to play it in E Minor. In the key of E Minor, here are all 32 bars of this tune. In measures 1-3, we can see right away we have a major 2-5-1 progression in G Major. This should look familiar from the last article. The C Major 7 chord in measure 4 bridges the gap between the major 2-5-1, to the minor 2-5-1 progression that follows. I haven’t discussed minor 2-5-1 progressions yet, so let’s do that now. The minor 2-5-1 chord progression is played with the 6th degree of the major scale acting as the key center. For instance, let’s pretend we are playing a minor 2-5-1 progression in the key of A Minor. The relative major of A Minor is C. So the C Major Scale is applicable in this case. Remember, here are the diatonic chords of a C Major Scale. If you look at the 6th chord from the left there you see an A Minor 7. The 6th degree of any Major Scale is always the relative, natural minor of that key. Now, to be more applicable to the tune we’re studying (Autumn Leaves), let’s look at a G Major Scale, and see what the natural minor is. If we count 6 chords over from the left we get to E Minor 7. If we shifted the entire set of chords over, and used E Minor as our key center, the it would look like this. Our 1 chord becomes Em7. Our 2 chord becomes an F#m7b5, and so on. If we were to form a 2-5-1 with these chords, it would look like this. And there you have it! A minor 2-5-1 in the key of E Minor. But something looks different than the tune. If you look at the chords in Autumn Leaves there is a dominant B7 in there instead of a Bm7. Why is this? Well that’s a common practice in jazz. When you substitute a dominant chord in for the minor we are using chords that are diatonic to the Harmonic Minor Scale. And this is okay. It’s the way it’s done in jazz! Also, a dominant chord creates more tension, before resolving to the 1 chord better than a minor chord does. This may be a bit out of the scope of this beginners series, so I will explain it better in another article, but here’s the main thing to remember. Now that you know you can use a dominant chord in a minor 2-5-1, it’s also worth noting that you can alter the 5 chord to make it sound better. The best example of this is to add a flat 9 to the B7 chord. When I play minor the 2-5-1 in Autumn Leaves I usually play it like this..
To me, the B7b9 sounds better than the B7 in a minor 2-5-1. Try it yourself, and see what sounds better. In many jazz tunes, dominant chord can be altered. Here’s what we already know about dominant chords. If you look at Autumn Leaves, you will notice that it is a combination of major and minor 2-5-1 progressions throughout the majority of the song. There is a part in measures 28-29, where descending 2-5s are used. Many times in jazz tunes, descending ii-V7s are used without resolution to a I chord. This is the case in Autumn Leaves in measures 28-29, as I have shown below. “But these are not diatonic to the key of E Minor/G Major” you may say. Yes, and like I said, jazz does it’s own thing. It’s best to learn the language of jazz, and accept it, rather than trying to fit it in the mold of what you already know. When you study a jazz tune, it will make more sense if you look at it in relation to the cycle of 4ths, rather than any specific key center. That’s because many jazz tunes are continuously modulating (changing keys). Another famous “canvas” to improvise over are the “rhythm changes” named after the chord progression of the George Gershwin tune “I Got Rhythm.” Many other tunes use this same format, and it is one of the most popular progressions in jazz. If you didn’t already notice, can you see that it contains within it, a 2-5-1 once it’s repeated? This is the chord combination in the beginning of the famous tune, “Take the A Train” tune by Duke Ellington. It can also be heard in the other famous bossa nova jazz tune such as “The Girl from Ipanema.” Here’s an example. “C Jam Blues” is a good beginner jazz/blues tune to take work on. If you come from a rock/blues background, it will be an easy one to grasp onto, and try out your new jazzy chops! If you need to brush up on your knowledge on the basics of the blues check out my article on blues chords and the blues progression. 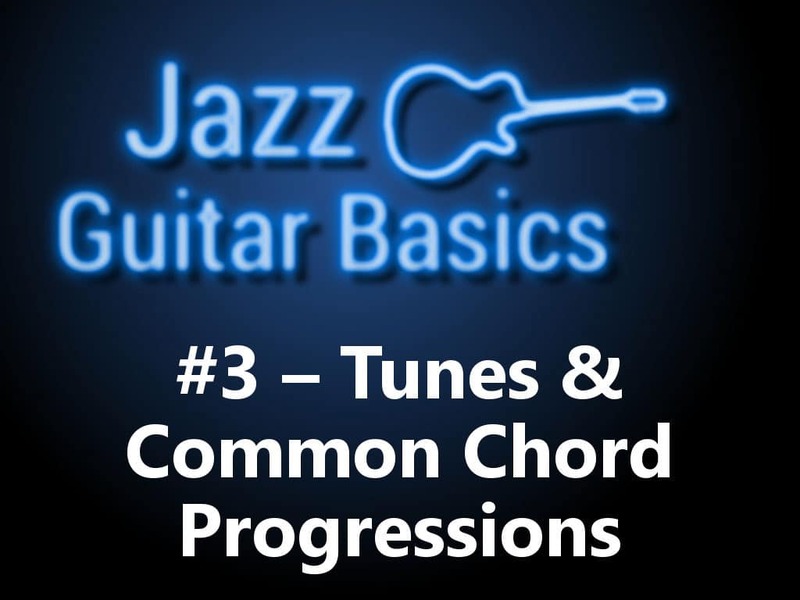 There are many common jazz chord progressions, and you can study each of them on their own, but it’s best to look at them in context of the tune itself. Here I have compiled a list of many of the famous jazz standards. I’ve tried to order them from most beginner friendly at the top, to most advanced at the bottom. If you are totally unfamiliar with many of these tunes I mentioned above, I would recommend you start listening to them to see which ones you like. This is easy with the convenience of YouTube and being able to hear any song we would like, any time we want. Just type the name of the tune into the search bar, and you’ll get many versions form various jazz artists. Some are going to stand out more than others to you. Start taking note of the artists you like as well. In my next article I’m going to talk about various artists I think you should become familiar with. Until then, your assignment is to start developing an idea of which tunes you’d like to be able to play, and the type of jazz guitarist you’d like to become. Have fun, and click the button below to move onto article #4 in this jazz basics series!